There aren’t many organizations that produce cards in higher volumes than a university. 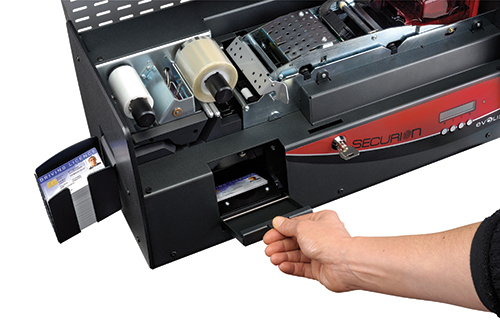 And when it comes to laminating secure identities and cards in high volumes, seeking ways to cut consumable costs without compromising card security and durability can be a constant pursuit. Wasteless lamination technology meets both of these demands and can provide both a cost-effective and eco-friendly alternative to traditional lamination methods. In HID Global’s free “Wasteless Lamination – Your Solution for Low Cost-Per-Card Durability” whitepaper, learn first about traditional lamination methods, then explore the benefits and proper criteria to consider when evaluating wasteless lamination solutions. In the whitepaper, HID explains how wasteless lamination technology aims to reduce the level of needless waste by eliminating carrier film, and thus, a subsequent take-up core. With wasteless lamination, overlaminate patches are attached to one another in a continuous stream of material, on a single roll and without an underlying carrier. As each patch is detached from its supply roll and adhered to a card, the lamination cycle is completed. From a cost standpoint, wasteless lamination has proven to reduce lamination consumables costs by as much as 50% resulting in a significantly lower cost-per-card. Crucially, delve into the details of wasteless lamination with a view to selecting the best solution for a university operation. Hear about laminate patch coverage, device readiness, intelligent temperature control, standard dual lamination, support for large-capacity consumables, general operation and warranty information. For more information, view HID’s full “Wasteless Lamination – Your Solution for Low Cost-Per-Card Durability” whitepaper.